Google Problem? 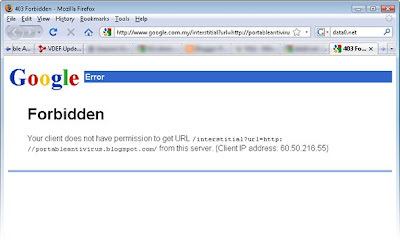 Turn all result to "This site may harm your computer"
Today and a few minutes ago, i'm trying to search some plugin for my Wordpress pages on Google Search but suddenly all search result turn into "This site may harm your computer". As you can see below is an images from the result. 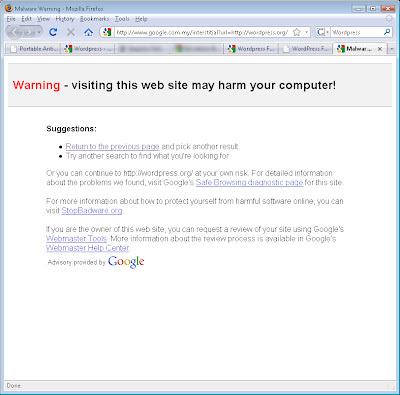 Then, if you click on one of those link it will turn result that says "Warning - Visiting the website may harm your computer!". See the images below. If we click to all link came from the result it will give a warning of a fake malware. This also include search on images. 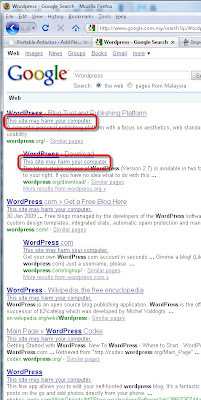 All the link will return result from the following URL example. To put it simply, a computer virus is just a small computer program that can replicate itself and place itself on a computer without the computer user knowing it. They typically come attached to other files. These files are typically executable files with a (.exe) file extension. People often use the term virus to mistakenly label other troublesome programs that are really malware or adware. There is a difference. Most malware and adware do not replicate themselves and therefore are not technically considered viruses. However, these days, malware is a far more common type of infection. Other things that can infect a computer but aren't really viruses are things like computer worms and Trojan horses. Trojan horses are very common these days. As their name implies, they often sneak into a person's computer because they come packaged as a useful program like a screensaver or something. Then, once they are installed on the computer, they open up ports (like a secret door to the internet) on your computer and allow other types of infections to sneak in. These other infections come in totally unannounced. You won't realize they are there until your antivirus program happens to detect them. By then, it is possible that their intended damage has already occurred. This is why it is important to have a firewall on your computer. The firewall increases the computer's security by closing all of these doors and locking them. The firewall only allows doors to open that are used by common programs like web browsers and email. For another port (door) to be opened, the firewall program usually asks for permission from the computer user. That's why you get the messages popping up in the lower right hand corner of your computer asking if it is okay for something to happen. Another type of infection is the computer worm. Computer worms are like viruses except they do not come attached to any other files. These worms can move from computer to computer across a network. They move from computer to computer by going through open ports. This is the biggest benefit of having a firewall to keep those ports closed and locked. The internet is one giant network. So, just by being connected to the internet, your computer is exposed to this type of infection. Adware is another type of program all together. Typically, these program come bundled with other software as well. When downloading some music sharing software, if you read all the fine print you would see that the reason that software is free is because it comes bundled with an adware program. The adware program will make pop ups come up on your computer. It might also modify your internet browser so that your search results are influenced in some way that benefits the author of the program. I can honestly say from experience that you can guarantee getting an infection by using your Windows based computer to browse the internet regularly if you do not have an adequate firewall on your computer. The firewall is far more important than your antivirus software itself. This is one of the most misunderstood computer security issues among the general public.